Since our arrival to El Paso we’ve been planning an epic trip to our neighboring state of New Mexico. 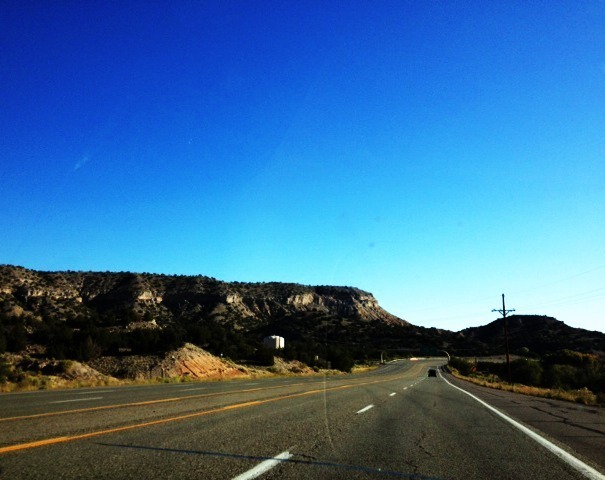 The husband is very fond of New Mexico (as he grew up there) so a trip to his home state was definitely in order. We were excited for a fun road trip, our first since the driving marathon from GA to TX in August. We hit the road with snacks, red bull and our learn Spanish in the car CDs. I haven’t really touched on it, but living in El Paso feels more like living in Mexico rather than Texas. Everyone here speaks Spanish (which is making finding a job a little difficult), and everything has a Mexican flair (not as Texas-y I was expecting) as we live on the boarder of Juarez, Mexico. It’s been an interesting adjustment, but hey the food is to die for! 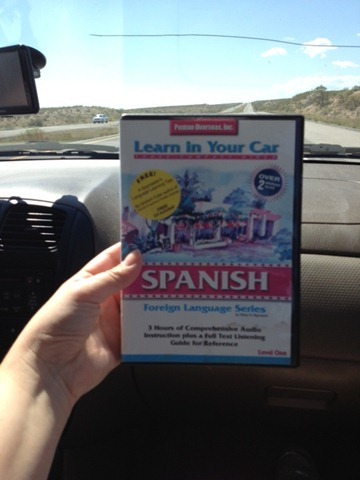 🙂 I don’t want not knowing Spanish to be an issue, so we were brushing up on our skills on the 5 hour drive through New Mexico. 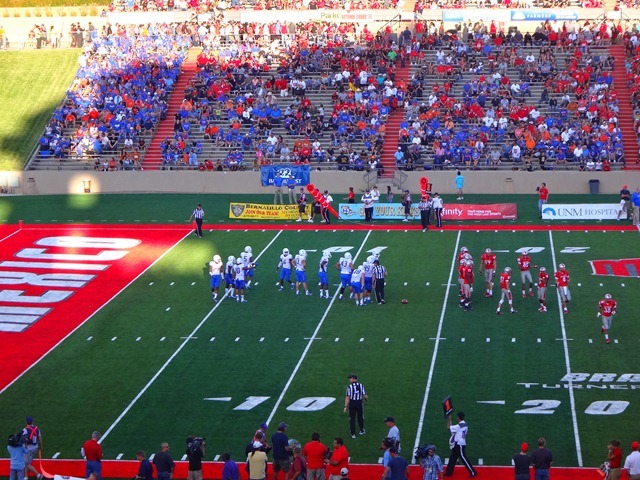 Our big activity of the weekend involved a nice little meeting of the Boise State Broncos and the New Mexico Lobos. 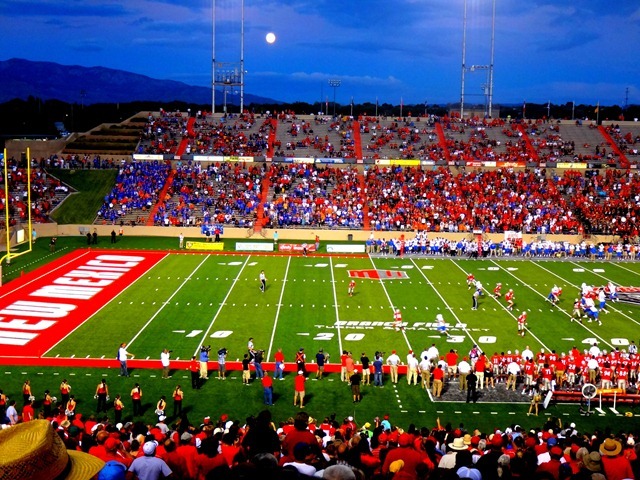 I love me some college football…but when I realized that Boise State would be playing New Mexico in New Mexico I was freaking out! I knew we had to be at that game. The game actually seemed like it would be a blowout at first. The first half ended with BSU leading 25 to 0. I thought for sure the second half would be a snoozer. Boy were we wrong. Those Lobos took us on an emotional rollercoaster ride during the second half. I was yelling, screaming, holding my breath, and at one point almost in tears. So silly how your emotions can take over during a sporting event. We did manage to pull out the big WIN at the end, but not without a good fight from New Mexico. Yeah, they came back from literally nothing to almost beating us in last minutes of the game. Whew, I was glad when that game was over. A win is a win, but that one was tough to watch. The rest of our New Mexican adventures involved food. I didn’t snap a lot of photos, but trust me when I say we were in red & green chile heaven. J. Alabama begged for us to make a stop at a favorite restaurant of his in Albuquerque called Sadie’s. 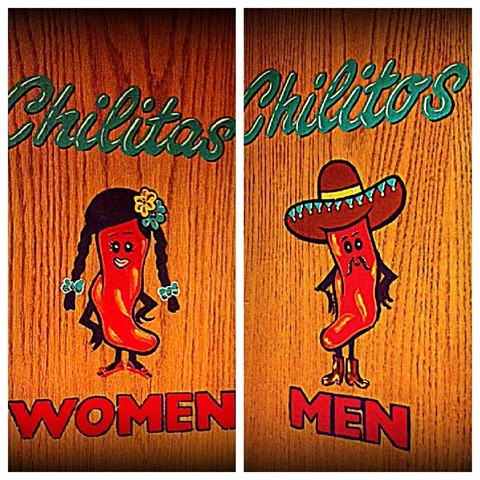 Everything is chile themed over there, as well as everything is SPICY! It was such a nice change from our bland food experience we’ve had in Georgia. 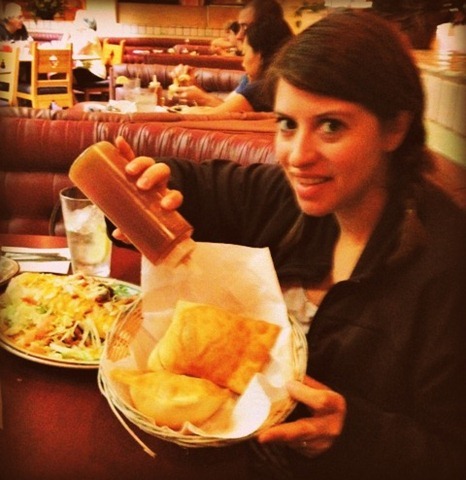 My favorite thing though were the fresh sopapillas! They are fried little puffy pieces of bread drizzled with honey. Ah-mazing! We managed to do a little bit of everything in our short little trip over to New Mexico. We explored some of New Mexico nature, ate some delicious spicy food, reconnected with family, cheered on our alma mater on the road, and just had some nice quality time catching up with each other during the car ride. It was the perfect getaway weekend that left us both refreshed and renewed. It’s funny how writing about my homesickness and slowness to adjust to a new place has snapped something in me – as I’ve now got a full calendar of events for October (including a blind coffee date with an Army wife!). I’m so excited to share all the happenings with you as they play out. Today is a day around the state of Idaho that people’s true colors shine. Mine just so happen to be blue and orange. 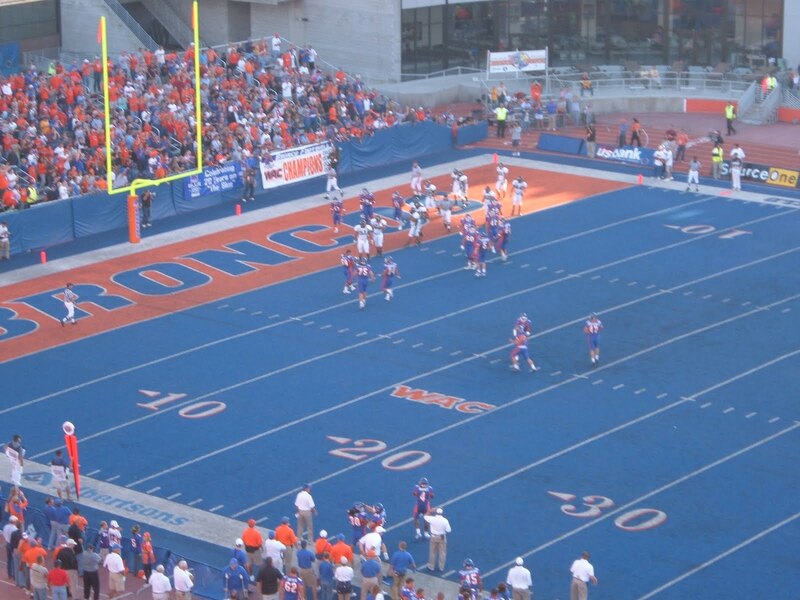 If you didn’t know the Boise State Bronco’s will play their rivalry game tonight against the University of Idaho Vandals. It’s always an exciting game, though it’s been a beat down for the Vandals for many many years in a row. 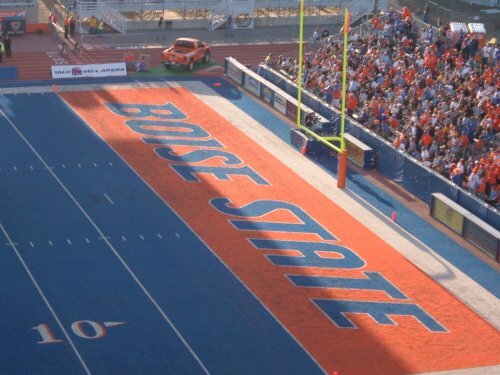 I can confidently say that BSU will come home with another W in their pocket. If for some reason they don’t then seriously ALL hell will break loose. There is no reason the number 4 college football team in the nation should lose this game. In preparation for watching the big game tonight I knew I wanted to get my spin on. Oh yeah, it’s been way way too long. I wasn’t sure if my body would know what to do. But as the story goes, my legs fell right into place and moved just as they were supposed to. The best part of our spin class today was that the Spin instructor was decked out in Boise State Bronco gear. She had also gone around before the class had started to scope out the Bronco fans and Vandals fans. Today’s spin class was amping us up for the big game tonight. Each song she played was hand-picked and dedicated to either the Bronco Fans or Vandals Fans. Broncos had songs like “Orange Crush” by REM and “We will Rock You” by Queen. Vandals had songs like “Fight For Your Right To Party” by The Beastie Boys and “Under Pressure” by Queen & David Bowie. Every song she played made me laugh out loud as she had picked them perfectly. She also did a great job of supporting both sides as not cause a complete riot in spin class. I kept waiting for the “We are the Champions” song by Queen, I guess that just goes without saying. We climbed hills, we did the Twist and Shout song by jumping up and down out of the saddle and even did speed exercises. I left there a mess. A big sweaty mess. 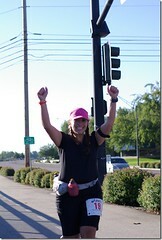 Now a side note: The shirt I am wearing in the picture is in fact from the Nike Women’s Marathon. It was so cute and I had to have it. I RUN TO BE! I am such a happier girl after going to spin class. I know this will help me to get through the winter months and should be a huge distraction to the fact that I will not be running as much or at all. But what I am most excited about is that when I first started spinning I noticed a HUGE difference in my breathing and how it helped me when I was running. So I am happy to be able to keep my endurance up for when I start training again. Because friends I have my eyes set on a race that is considered one of the hardest half-marathon’s in the northwest. The Race to Robie Creek is an 8 mile up hill, 4 mile down hill beast. And I am NOT scared of those hills anymore. 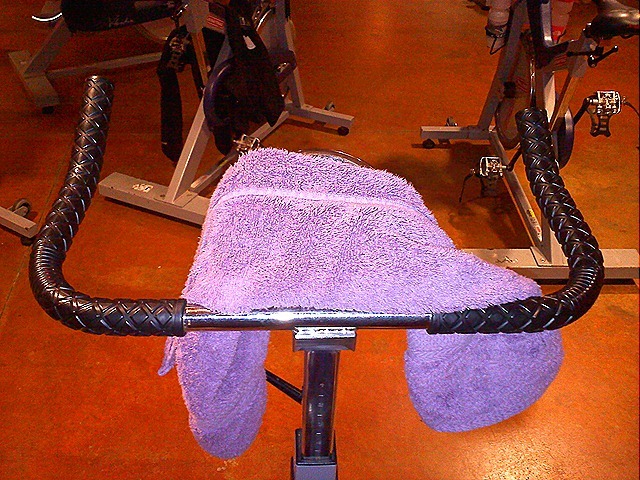 Spinning is going to get me through until I can really train for that beast. Now I must shower up and prepare for the Big game! So you may have heard about that football team that plays their games on the blue ‘smurf turf’. Well they come from a land abundant with potatos. But let me just tell you, we may like our potatos, but we LOVE our broncos! Yep, these guys are my team and today they are two-time Fiesta Bowl Champions! I was excited to watch the game last night and was even more excited when I realized I would be watching it with almost the whole WILL RUN FOR WINE gang! Okay so we weren’t running but we definitely talked about doing it! Since the incoming of this cold, snowy, icy weather we opted to take a few weeks off until the sideswalks were no longer a danger zone. It seemed that everyone misses our runs so much, you might even see an appearance from the gang this week if the snow holds back. Woo hoo! I have made a few New Years Resolutions just as a way to keep myself motivated and focused for the new year. I will be revealing them to you later this week. But one of them is to cut back on my alcohol consumption. I really don’t drink that much, it may seem otherwise considering all my posts on wine! (I love it!) But I would like to concentrate more on putting good things into my body. 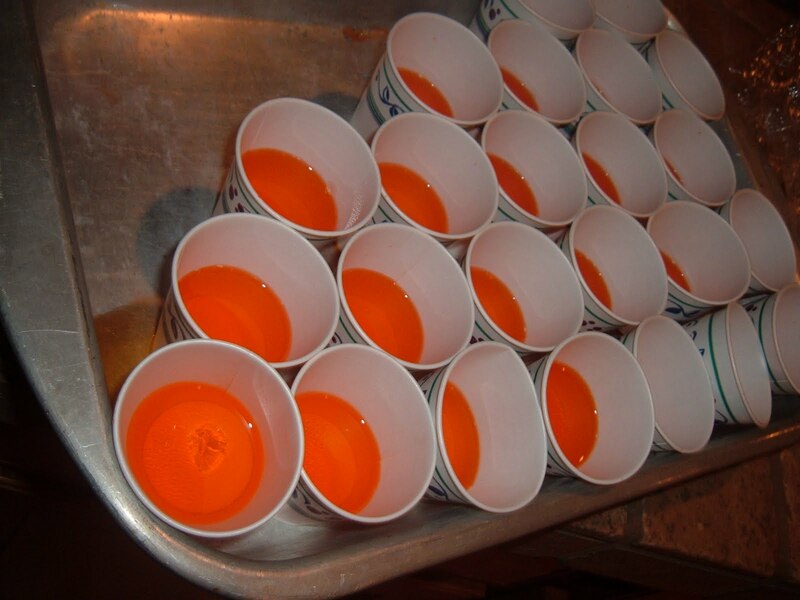 This proposed an interesting dilemma at a football party. 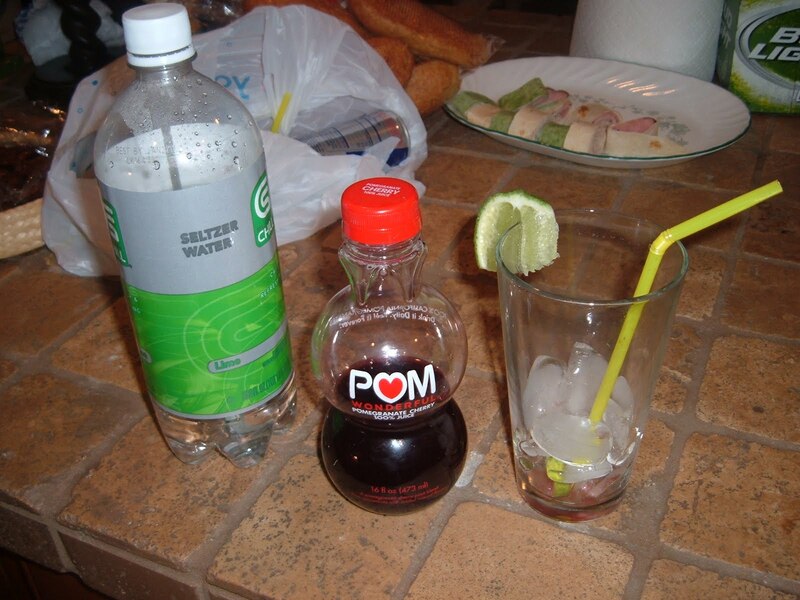 Well my solution was the Pom-Spritzer! 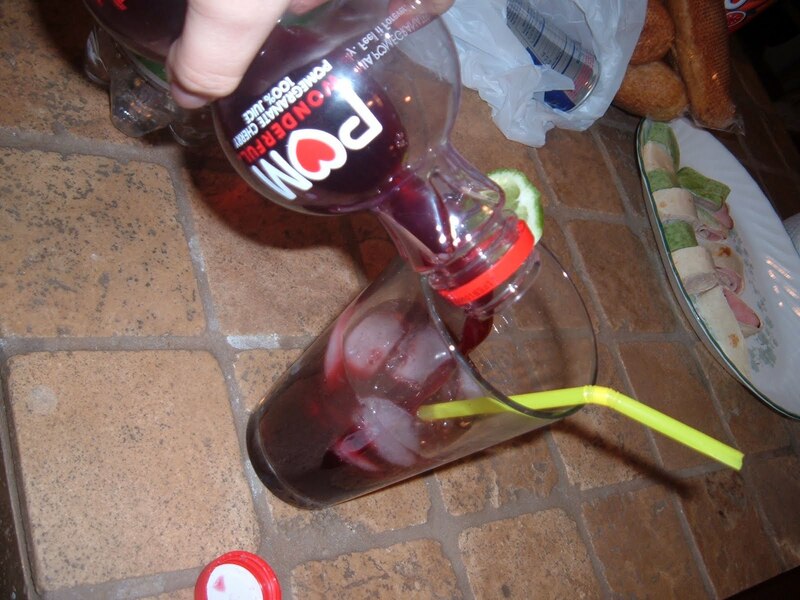 All you need is Lime Spritzer, Pom Juice and some cut up limes. It made for a fruity fun drink that has some healthful benefits and if you don’t tell people they will never know it’s alcohol-free. It’s the mock-tail of all mock-tails! Yum! But, it was still a football party. 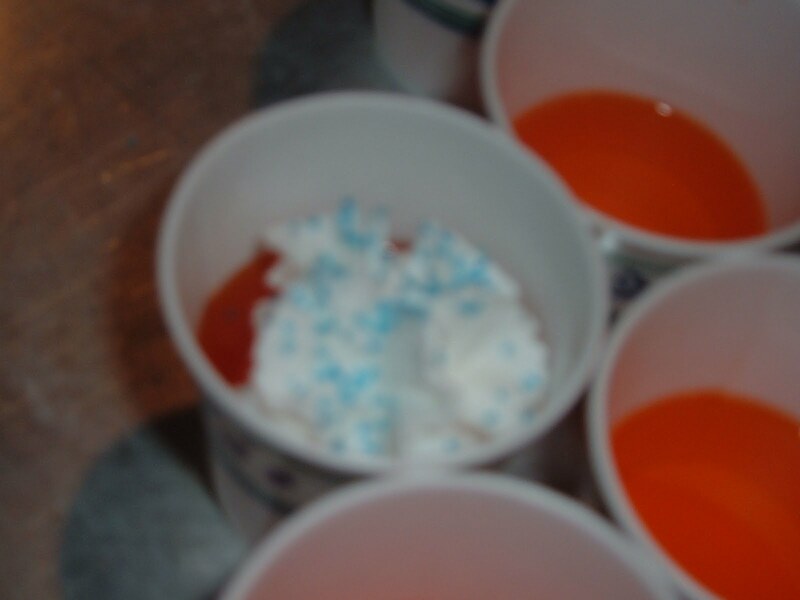 So we had to throw in the not-so-healthy Fiesta Bowl tradition… Orange Jello Shots w/ Blue sprinkles! 🙂 We only took one when we we scored a touchdown. It was a fun night with friends and I was super proud of myself for sticking to a healthier way of being. And proud of my Broncos (17-10)! They keep proving everyone wrong and have finished off the football season as the only undefeated team. What tricks do you have for choosing healthy at partys, tailgates, etc? 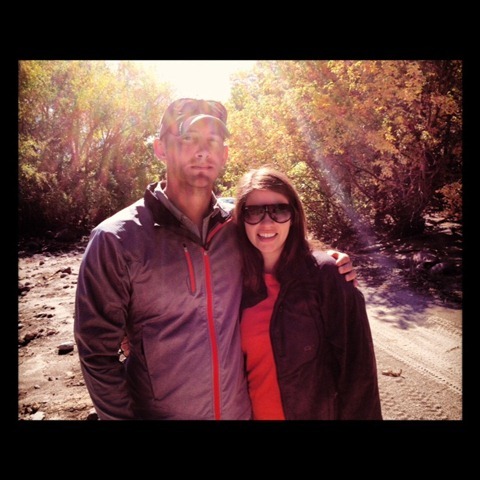 First of all, I am super excited to announce that J-Bomb my older brother has moved back to Boise this week! He has been living in Pennsylvania for many many years and just got a job back here in Potato Land. I’m am excited to have him back here so us siblings can hang out together. Tonight is going to be “Brother Sister Brother Night”. I can only imagine the kind of trouble we are going to get into when Twin Powers & J-Bomb are out on the town. But you can be sure that whatever the mischief, I will have a full report tomorrow, unless I’m in jail. Just kidding…. Right now I’m trying to convince both of them to join up with “The Will Run For Wine” running group tonight. The Men:Ladies ratio is non-existent so they have good odds. Plus it would be fun to give them a glimpse into what I have been up to these last few months. See if the boys can hang with the girls. I will let you know if they join up. 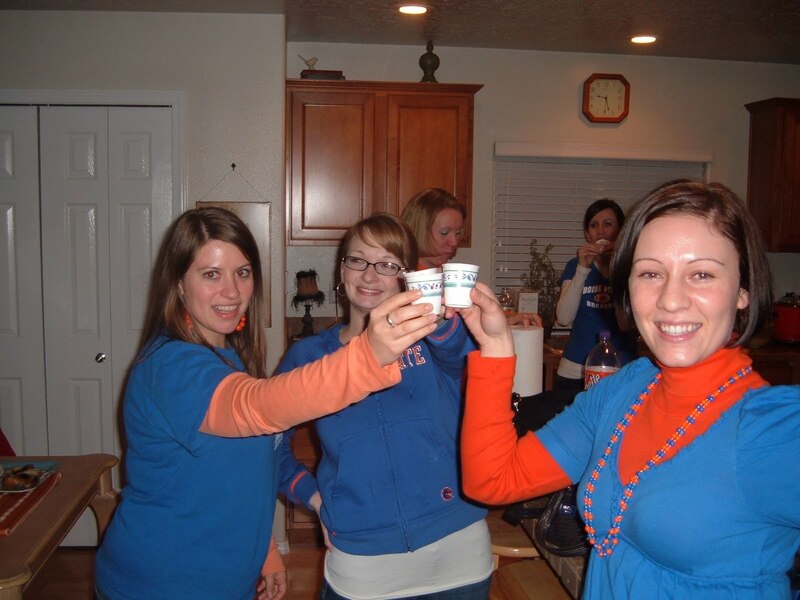 Then we will be watching the Boise State vs Utah football game. I am a HUGE fan of BSU f-ball and we gotta keep up the winning streak. Go Broncos! I’m feeling super sore today. I (literally) hit up the Body Combat class last night at the gym. It was a bit more intense this time but amazing as usual! I love love love this class because I feel like I am getting an overall body workout. My arms, legs, core… it’s all sorts of sore today. It’s that good sore though. The kind that reminds you that you did something last night and gives you the urge to do it all over again. I find that I more motivated by a group setting. Whether it be group exercise classes, the running group, races, etc. I am trying to find inspiration to bust out of my comfort zone and do some more challenging stuff on my own. I would like to incorporate more strength training routines into my workouts – but still feel clueless. Right now there is no strength training whatsoever in my routines. 😦 I have heard that not only will strength training help in weight loss but it can actually help shave off time when running. Stronger muscles = fast runs?! Count me in. Happy Halloween, Blue & Orange Style! As I was pulling into my apartment complex after a great workout at the gym, I could hear the screams of “BOISE….STATE!” echoing through the sky. I was surprised at how well I could make out the yells from Bronco Stadium. It brought an instant smile to my face. 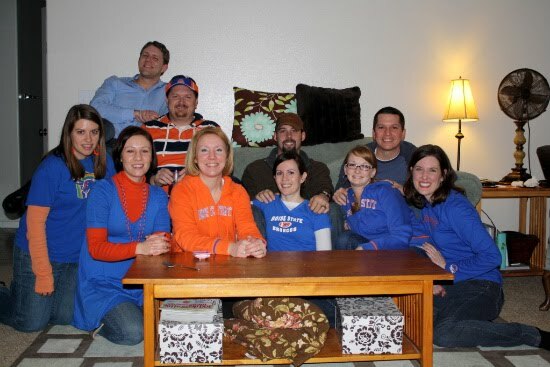 I am a die hard BSU Bronco fan! If I didn’t have so much Halloween prep-work to do today I myself would be down there with the rest of them hooting and hollering for the Blue & Orange! 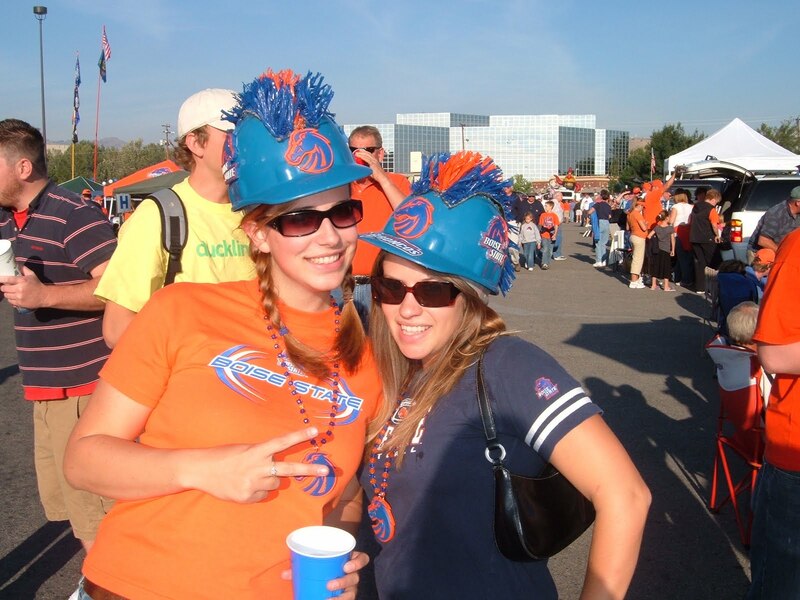 This is my friend Tara & I at a bronco game. This picture is circa of about 2006. It’s the most recent awesome bronco pic I could find. I surely need to fix that! Happy Halloween everyone! I bet you can’t wait to see what I have in store for you for my Halloween edition. I am hosting a Halloween Bash tonight and am excited to report the after math tomorrow! ***Update: Bronco’s won 45 to 7!! YAY! 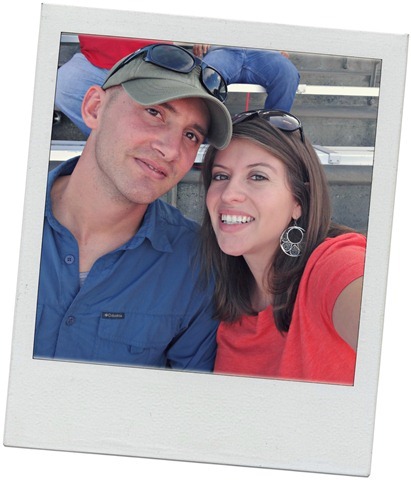 My name is Linzi and I'm a marathoner, lover of all things fitness, a newlywed military wife, and just a person who is learning how to find a healthy balance in my life. This blog encompasses a little bit of everything!